Brian Gartside demonstrated the potential of paperclay when he was a guest at the International Potters' Festival, Aberystwyth, Wales, 1993. This is Part II of his article on paper/clay. 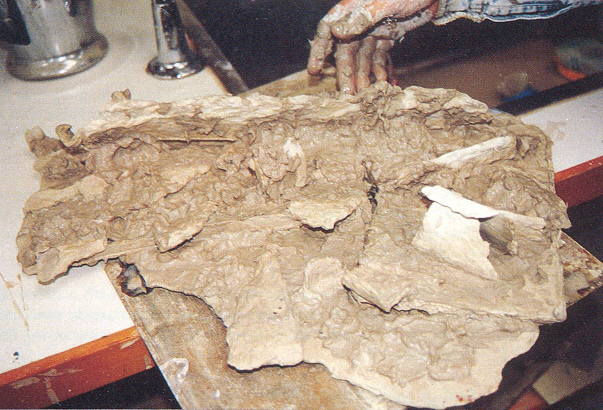 To read Brian's first article on making paperclay click here. Those of us involved with pottery as a living are continually on the look-out for sales possibilities. Suitcase Art was a phrase enjoyed by English potter John Pollex and myself in a conversation a few years ago. It refers to making high-value ceramics that would travel easily around the world, and would of course, be in high demand. I witnessed the ultimate in Suitcase Art when the American potter Ron Nagle brought a very small suitcase to his slide talk, opened it and set up a miniature exhibition on a table in front of his audience. This concept of Suitcase Art was then further expanded by the guest demonstrator at the International Potters' Festival in Wales, 1993. He opened a large suit case on the stage and told the audience the four slabs of clay he pulled out, had travelled half way around the world, surviving airline baggage handlers in Auckland, Los Angeles, Seattle and Heathrow airports. He revealed that these slabs were unfired and proceeded to wave and jiggle them up and down whilst holding them between fingers and thumb at the very edge of the 60cm long slabs. They did not break, though they seemed to bend slightly as they were handled in this way. During the hour or two of his demonstration he assembled a rectangular box which consisted of bone-hard, leather-hard and sloppy paperclay. Imitation straps and buckles were modelled wet onto the dry surface. A pre-made stiff handle was then attached with scoring and paper/clay slops - voila! A clay suitcase! To the amazement of the audience he then lifted the suitcase by the handle after only half a minute and was able to walk around with it totally intact! Quite simply, paperclay has the ability to stick to itself and be really strong no matter how dry or how wet. It is possible to join anything of any thickness, at any angle, at anytime, using paperclay slip as a glue. It will also join easily to ordinary clay. It seems that nearly all rules of clay making can be broken. My preference is to make slabs on a dry plaster slab with a mixture of clay slip and 30 - 50% paper pulp. For large amounts of paper pulp a conversation with a maker of handmade paper would be helpful. They have ways of making paper pulp and also use linters, a readymade source of cellulose fibres. Any clay slip can be used, but I find a readily accessible source from my wheel slops and trimmings which are easily soaked down. lf clay is removed as slabs from the plaster the following day, these can be rolled into tubes of any diameter for future construction. Or it can be scraped away from the plaster while still wet and mixed by hand into a plastic state. Coils can then be made or wheel throwing attempted. Whilst in the slop state it can be spread or poured into moulds and left to dry out. Objects do not have to be made hollow. I leave my slabs to go bone-dry on the plaster slab. They do not warp and I am able to stack them on edge for storage and future use. At first it seemed that all my ideas wore limited to straight, flat-sided forms once the slabs had been made. Recently I decided to re-soak a paperclay slab by totally immersing it in water in a shallow tub, leaving it for at least three hours. The clay and fibres re-absorbed water until the large slab became flexible enough to wrap around into a shape. If a slab is left in water overnight it becomes very sloppy at the surface, but still holds in one piece and is extremely flexible. So it appears the material can be dried out and wetted many times without ill effect. Hard surfaces can be plastered and modelled on with more sloppy clay. Fired or glazed ceramic objects and bits of any kind can be pressed into thick paper/clay while it is still wet. It all dries together without the cracking usually associated with shrinkage. Texture is easily controlled too. If left to itself, the paper/clay dries with a characteristic lumpy porridge surface. At any stage this can be smoothed with a very fine sponge or, depending on the water content, with rough sandpaper or file. Imprinting works well, but carving is definitely hindered by the cellulose fibres clinging to each other in the mix. Firing. Special considerations are recommended if bisque firing is done in an electric kiln. The paper fibre starts to burn away at300O and can fill the studio or kiln shed with unpleasant fumes. This smoking can continue up to 500OC. It's important to fire slowly during this period - between 5OOC and 75OC per hour- and to fire with vents and door open if possible. The room should also be well ventilated. There is not the same problem when firing with wood, oil or gas, as the fumes depart up the flue. Once the paper is burnt away the firing can continue as normal. After bisque firing the appearance and texture are normal in everyway. The fired clay looks and acts as clay always does. The minute spaces formerly occupied by the cellulose fibres cannot be seen by the naked eye and the only noticeable difference will be a lightness in weight, especially when the mix is 50/50, paper to clay. Glazing can proceed as it always does - the fibres are gone and play no part in the ceramic process. Any glaze can be used and the results will be as brilliant or depressing as they always are. Salt fire, raku, reduction or pit firing can proceed as normal. The slab roller could become an endangered species - on the verge of extinction. Watching people work with this material is enjoyable. Hands covered in 'sludge', they can be so adventurous - joining and building with little or no technical skill. None of the ordinary clay rules apply at the construction stage. lifting and moving work is less of a problem and breakages seldom occur. This can open up the mind to structures and forms that flow in a natural way, especially in the sculptural area. A bold, adventurous approach with seemingly impossible assemblages can be tried. Fragility is a thing of the past with structures remaining strong though its pieces may be arranged and re-arranged many times. Paper/clay offers endless possibilities. Information on this topic is only at the beginning stage, with new methods and discoveries emerging weekly. Top row: Storing paperclay as bone-hard rolls, tubes, slabs and also crushed waste ready for recycling. Row two and three: The working of wet and hard, dry pieces together. 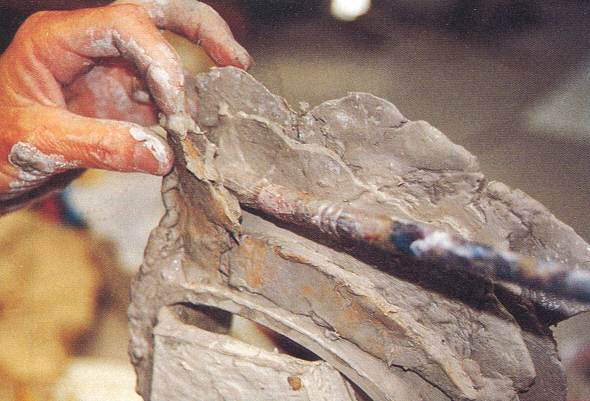 Last photo demonstrates a joint defying breakage and gravity.Last row: The paperclay slip being roughly cast into plaster moulds, and coiling. The final photograph shows shards and other ceramic material pressed into the clay. Top row: Storing paper clay as bone-hard rolls, tubes, slabs and also crushed waste ready for recycling. Row two and three: The working of wet and hard, dry pieces together. Last photo demonstrates a joint defying breakage and gravity. Last row: The paperclay slip being roughly cast into plaster moulds, and coiling. The final photograph shows shards and other ceramic material pressed into the clay. Reproduced with kind permission by Brian Gartside. The article appeared in a slightly different form in New Zealand Potter, No. 1, 1994 17-18.